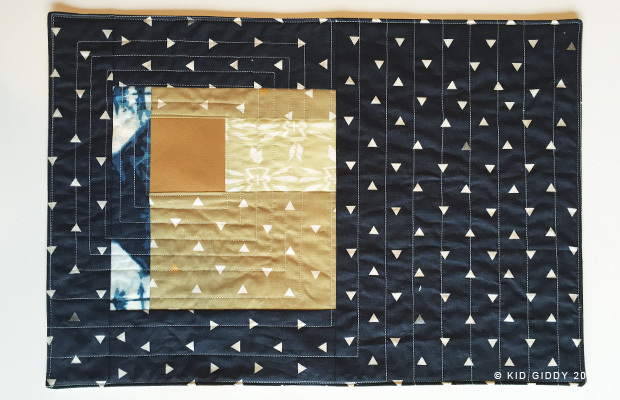 It's a new week and a new block for the Land of Magic Quilt sew-a-long. Today we are talking about the Castle block, and blogger Cristy from PurpleDaisies, as well as our sponsor Aurifil. 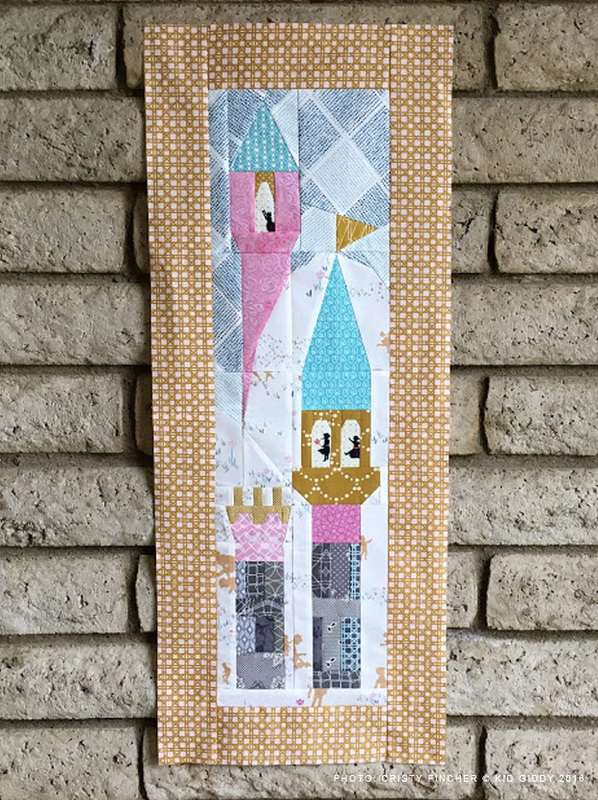 I had so much fun designing this Castle block based on Sarah Jane Studio's Magic fabric "Castle Plans". As I designed this block, I took elements from Sarah's Castles like windows, turrets, towers and the cloud line that bounces across the block. I love the illusion this line gives, that there are thick low laying clouds or fog with the castle hanging around in the distance. 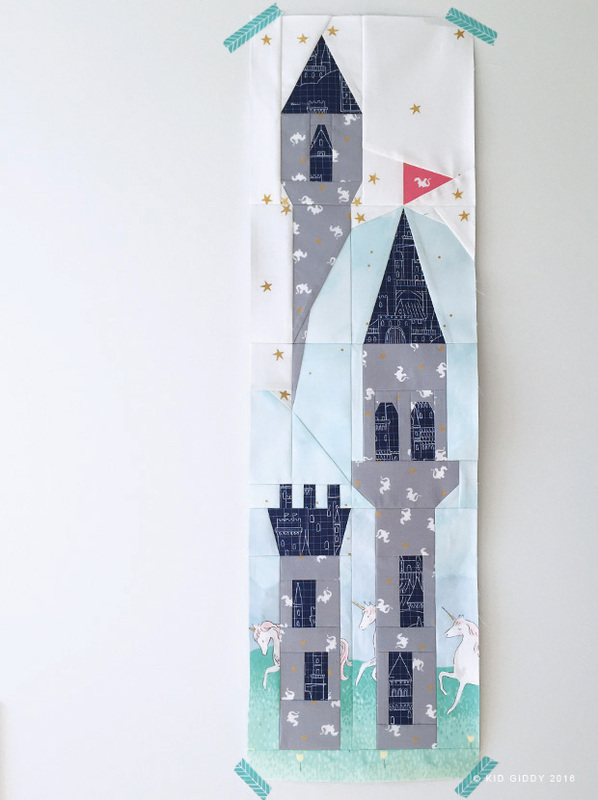 When I first designed the Castle block it was much wider than 8", and quickly realized it was the wrong width and wouldn't fit in my quilt plan. I was so bummed because I loved it (and finished it) - but took a deep breath, changed the width, and loved it even more. It became longer and skinnier and looked perfect (and of course it fit in the quilt). The best part about the Castle block is that it doesn't have any angled sections to put together. 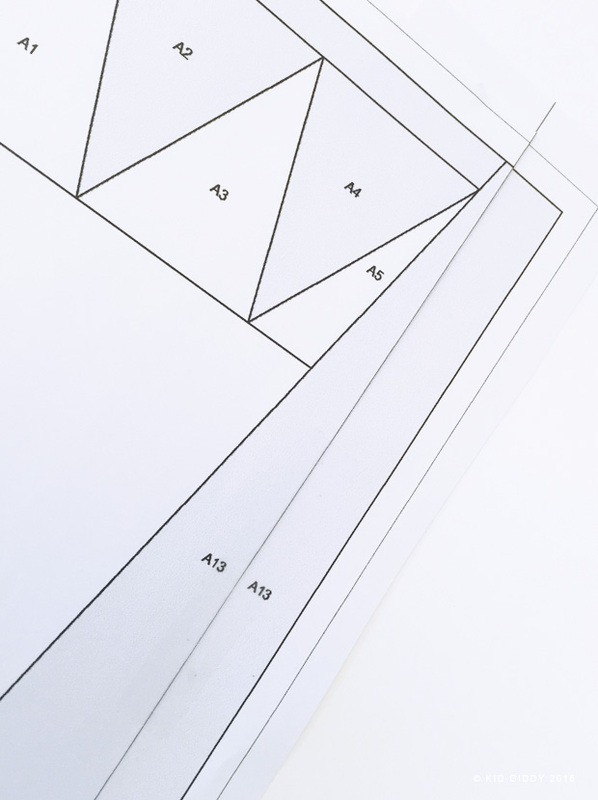 All of the sections themselves are straight lines so the sections go together easily. The only time consuming part about this block is the fussy cutting for the background, and of course the little flag (I put the dragon on mine)! There are two things to think about as you are piecing your Castle. 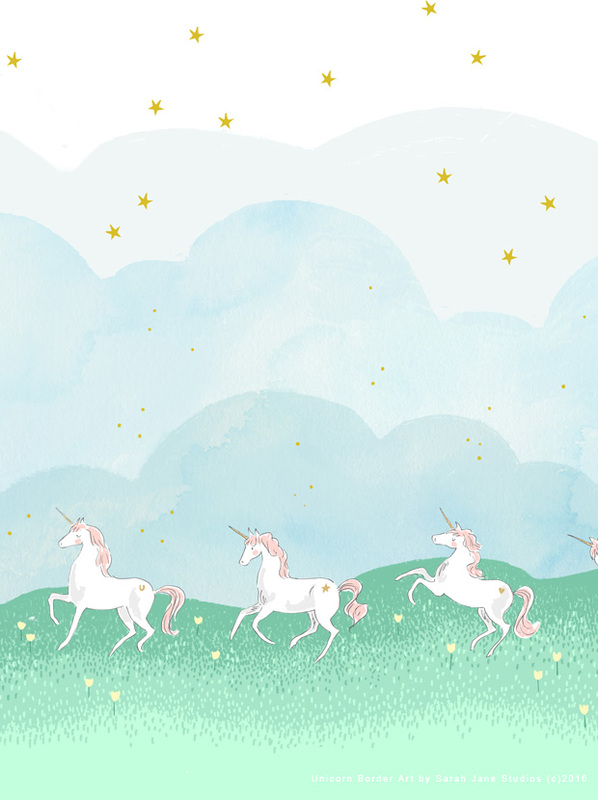 The first is you'll use the same print (Unicorn Border) for the background from top to bottom. As you can see below, there are 5 different layers to use. The white with gold stars, greyish white with gold stars, light blue with tiny dot stars, deeper blue with tiny dot stars and of course the grass. As you piece the sections, be mindful of the lines and the fabric usage. 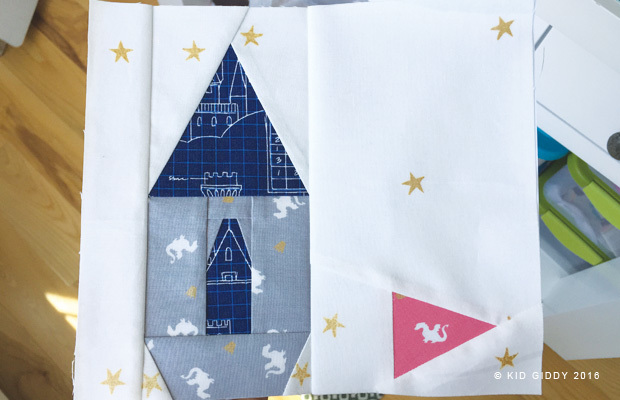 The second part to consider while piecing your Castle block is the Navy Castle Plans and making sure the "plans" stay upright and not sideways or at an angle. 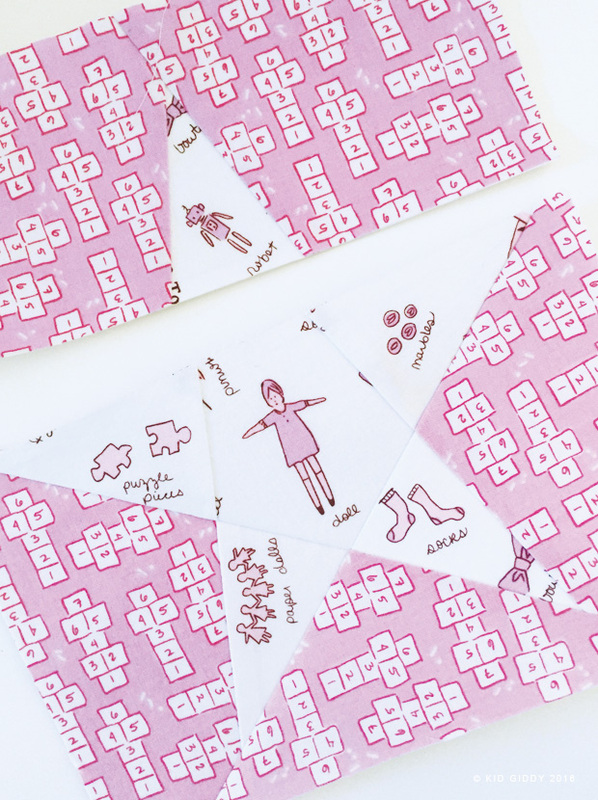 To make sure your directional prints show the way you want them to, place the paper piecing block pattern upright. Place the fabric right side down in the way you would want to see it. 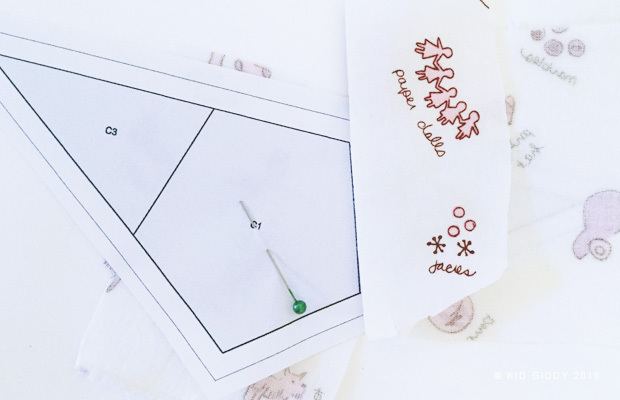 Fold the line of the fabric where you'll sew, and then move that piece under the paper. lining up the fold. Flip the fabric back the opposite way before sewing that seam. (photo shown below is from the making of the unicorn but illustrates my point perfectly). I love the versatility of the Castle block. One of my pattern testers this past summer, was inspired to make her 'castle' into a Sand Castle block. I looks to me that she used the "sand" colored print on the sides of the base to "support" the structure. I love the concept she completely switched it to. Shauna (@smoobug) decided to add a couple of extra lines. One extra line to add another layer of clouds (or fog), as well as a grass line to denote a rolling hill. I also love that she used a bright yellow fabric in the upper tower window. It looks as if someone is in the tower and the light is on. lol. My awesome blogger friend for today's block is Cristy from Purple Daisies Quilting. Cristy decided to make her Castle block look like Sleeping Beauty's magical tower, complete with little princesses in the window. 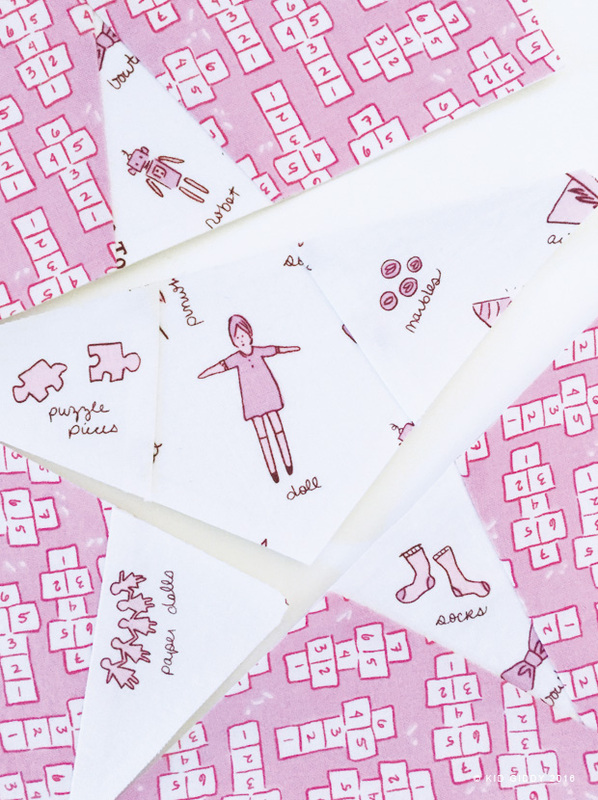 Cristy is the queen of paperless paper piecing and taught me all I know about glue basting! 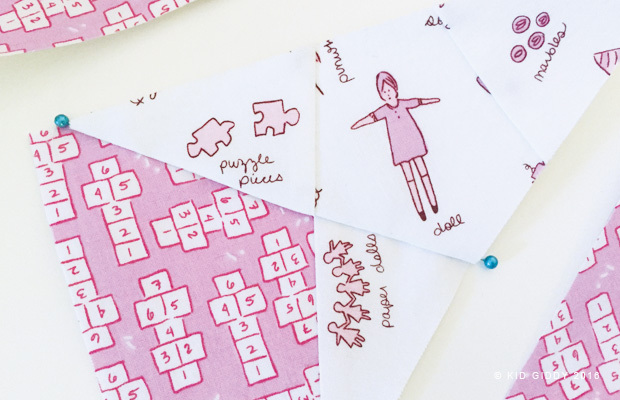 She shares some of her tips for glue basting the pieces backwards all at once, then sewing. It's crazy awesome! 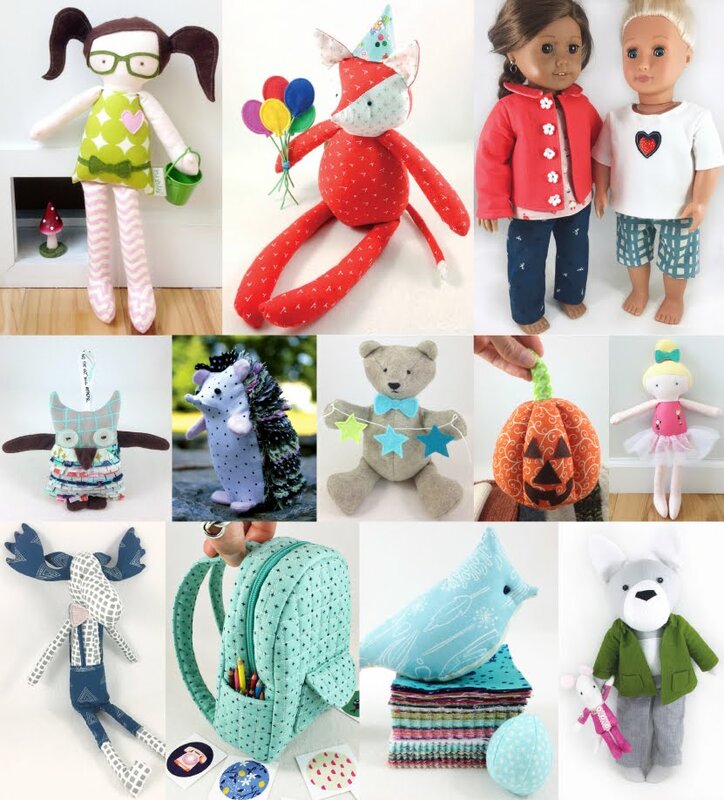 You can find more about Cristy (@cristycreates) and see all of her amazing creations by checking her site Purple Daisies Quilting. I'd like to thank our sponsor Aurifil for providing the prize for this week's block release. 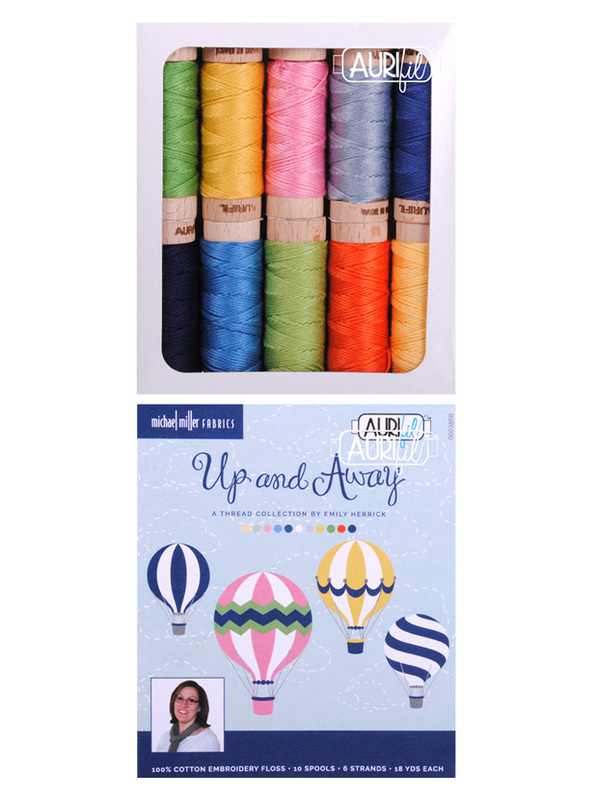 Aurifil is providing one #landofmagicquilt participant one of their small spool collections box (jealous!). 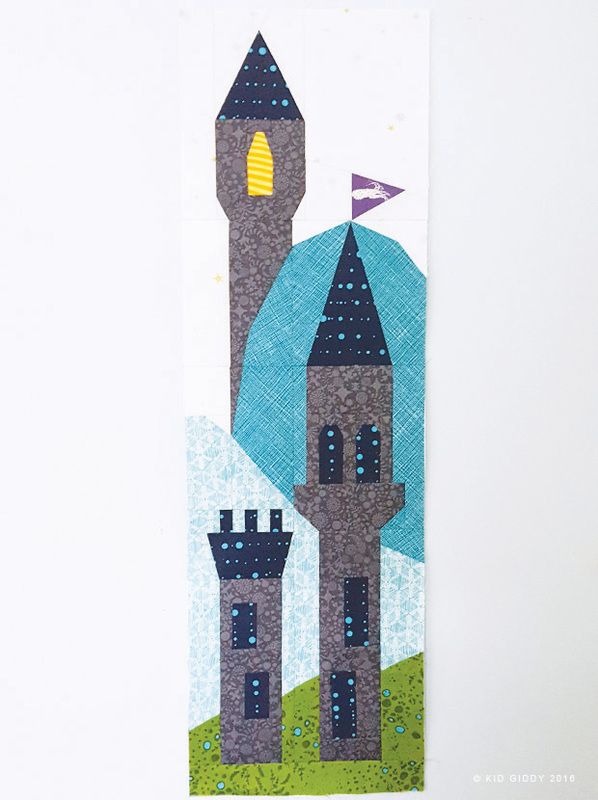 For your chance to win Emily Herrick's (also a Michael Miller Fabric designer) Up and Away small spool collection, 1: be sure you are following Aurifil (@aurifilthread) and myself (@kidgiddy) on Instagram, 2: post pics of your Castle block and tag it with the #landofmagicquilt and tag myself and Aurifil so we can see it, 3: post and tag it prior to the next block release in 2 weeks. Winner will be notified when the Dragon block comes out. Thanks so much for joining in on this sewalong. I really enjoy seeing all of your blocks and look forward to seeing more as the weeks progress. Please do let me know if you have any questions at all and be sure to check out the Dragon Block post up in a couple of weeks! Disclaimer: I received fabric from Michael Miller Fabrics back in April to design this quilt for Sarah Jane Studios Quilt market booth. I have not received any product or monetary means from the sponsors of this sew a long for this sew a long or for their participation as sponsors. Opinions are my own, and there are no affiliate links. Thank you. 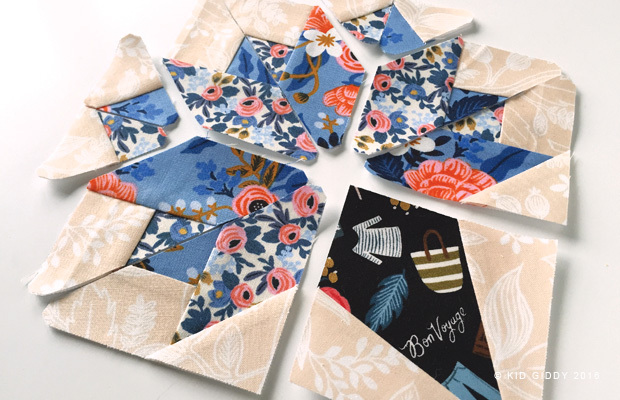 I'm so thrilled to be a part of April Rhodes Observer Fabric tour, and to get my hands on her newest fabric line Observer with Art Gallery Fabrics. 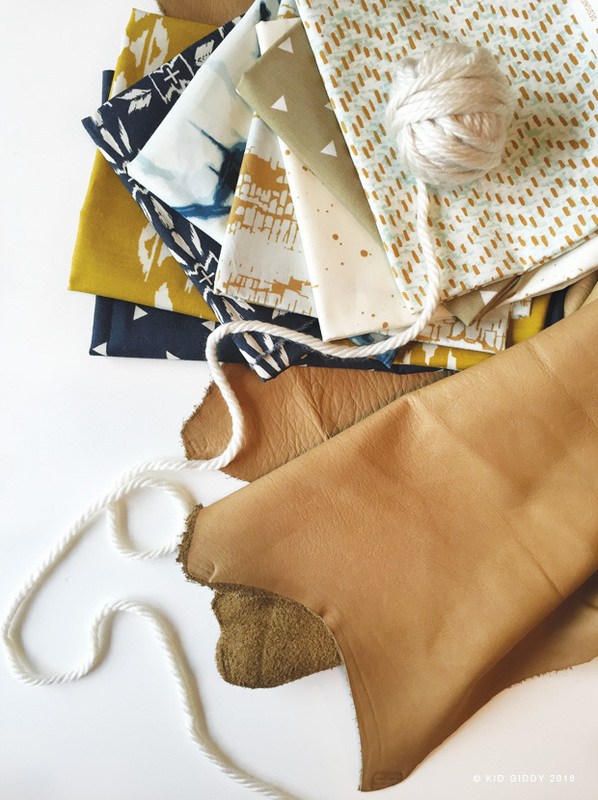 I'm not sure what it is - be it the color palette or the prints - that make me want to associate leather, raw wood and plush yarns with April's fabrics, but it's always there. It all just plays so nicely with one another. Don't you agree? I was so slammed for the past month and sat staring at this stack of fabric she sent me, itching to get started on this project, but couldn't. I had a few ideas in mind but couldn't settle on just one thing. I asked my family which they would choose and the vote was unanimous. A couple of years ago I made my cousin and his beautiful bride a nautical themed table runner and place setting complete with cloth napkins. As I shipped it off, my daughters voiced their disappointment that we didn't have our own set of "mommy made" place mats. 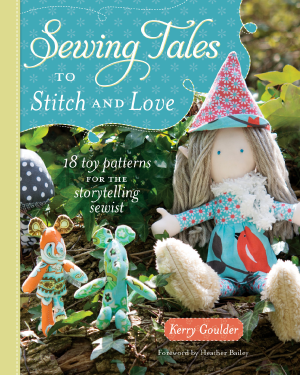 I knew someday I was going to have to make some - but when it's "just for me sewing", I don't get to do much of it. Finally the chance presented itself and I couldn't say no. After finding some huge leather hides at a local discount retailer shop (for only $25 each - total steal!) I knew I had to work leather into the blocks with these observer prints. I didn't want to have blocks with multiple sections that would require a bulky leather seam so I kept them simple. The fabric inspired me to start with either a square or a triangle in each block. Each 7" block started with the leather piece and work outward with April's fabrics, so the leather remains flat. I After trimming the blocks, I then added the log cabin style border The place mats are 12" x 17" finished, which is a fairly standard size for placemats. I only quilted the top layer with batting and decided to quilt each one with a simple echo style fmq pattern based on the leather piece in the middle. I then added the backing, right sides together, turned them right sides out and top stitched the edges. Eventually I will make some cloth napkins to go with them and some leather napkin rings. I had so much fun making these and each of my family members are thrilled beyond belief that I don't have to mail these babies out to someone to be photographed or to keep. These will so happily live on our wood table for a very long time. 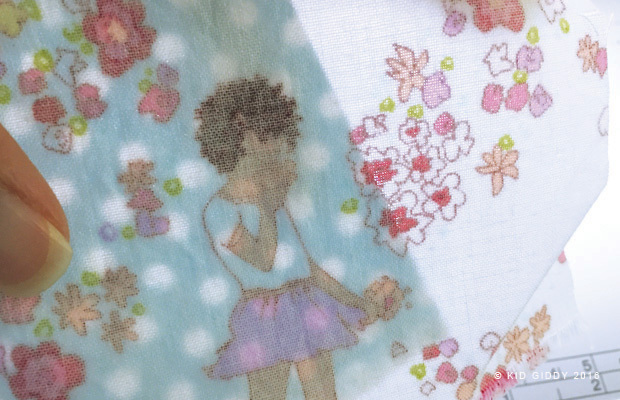 I love April's sweet demeanor and her fabrics exude the same feelings. I hope you will all take the opportunity to place with it too and see what it inspires you to make. Thanks so much for stopping by and reading all about these placemats as inspired by April's Observer Fabrics. 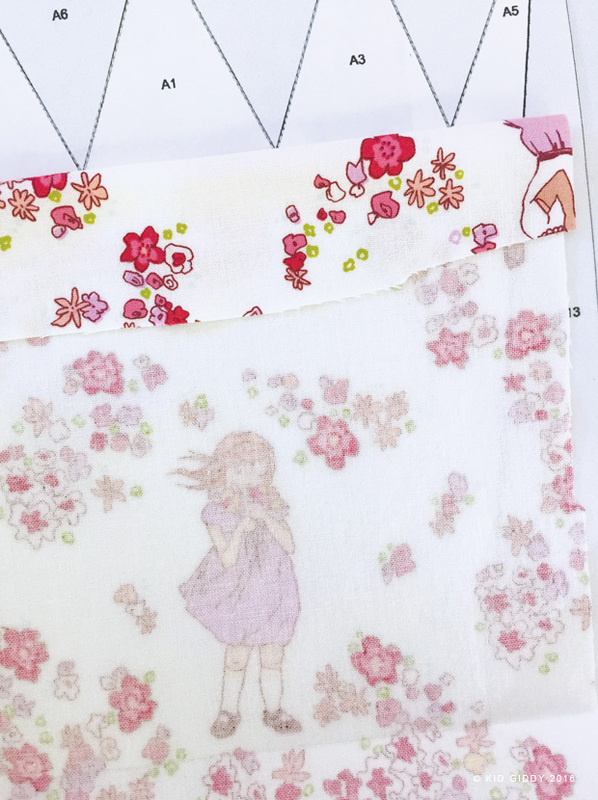 For more information or to find out where you can get some of April's new fabric, visit April's website (link above) or the Art Gallery Fabrics site. Holly from @hollygetsquilty is the next blogger up on the tour tomorrow. 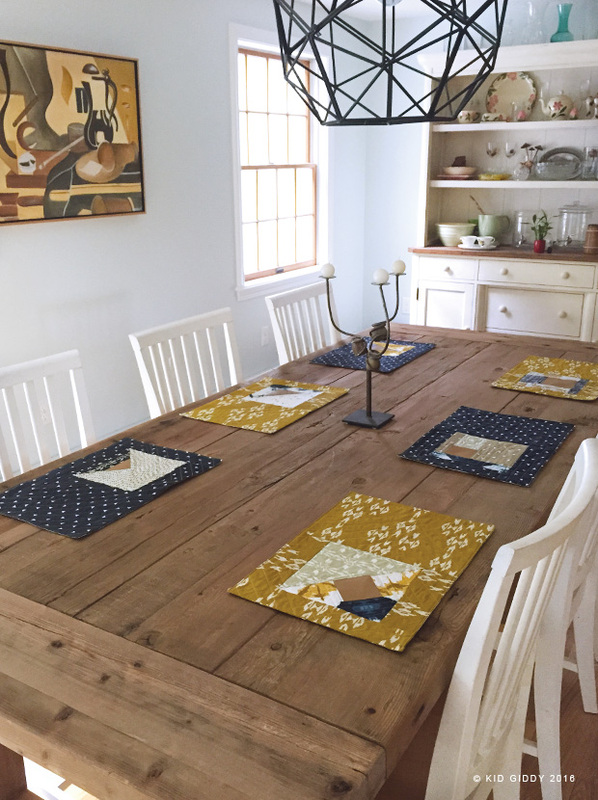 Disclaimer: I received fabric from Art Gallery Fabrics to design these placemats with. Opinions are my own, and there are no affiliate links. Thank you. I'm excited to share my third block (Bride # 17) for Angie (GnomeAngel) and Fat Quarter Shop's Farmer's Wife QAL. I decided to paper piece this Bride block because of all the smaller triangular pieces, and because it's just so fun and easy. 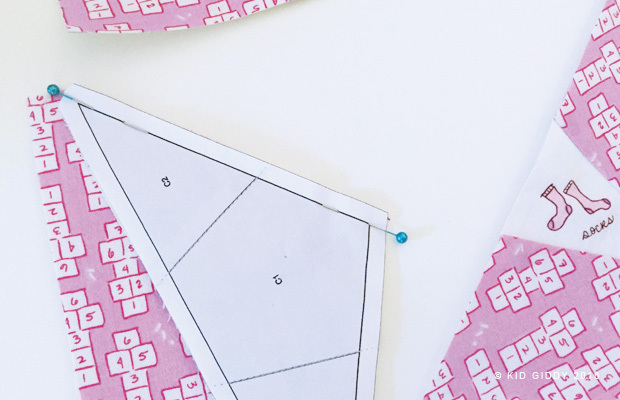 If you are new to paper piecing, check out my Tracy block tutorial for some of my paper piecing tips as well as my own paper piecing tutorial I recently posted here for my own Crown and Star blocks. 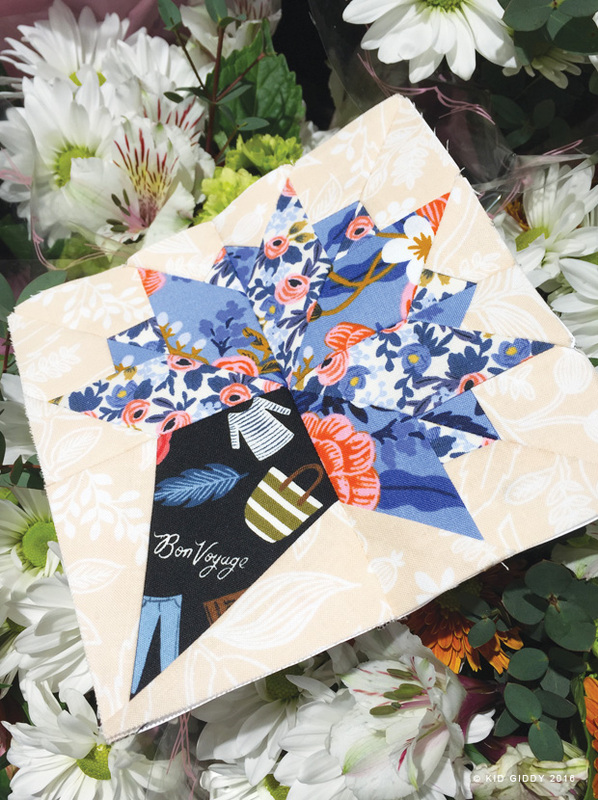 You can also check out Angie's Bride post in the which she has linked up many of the bloggers that shared full paper piecing tutorials. I loved the story of the Bride that was getting married and moving from the City to the farm. Reminded me of my move from Long Island N.Y. to Maine more than 15 years ago. I picked the fabrics to represent a bridal bouquet. 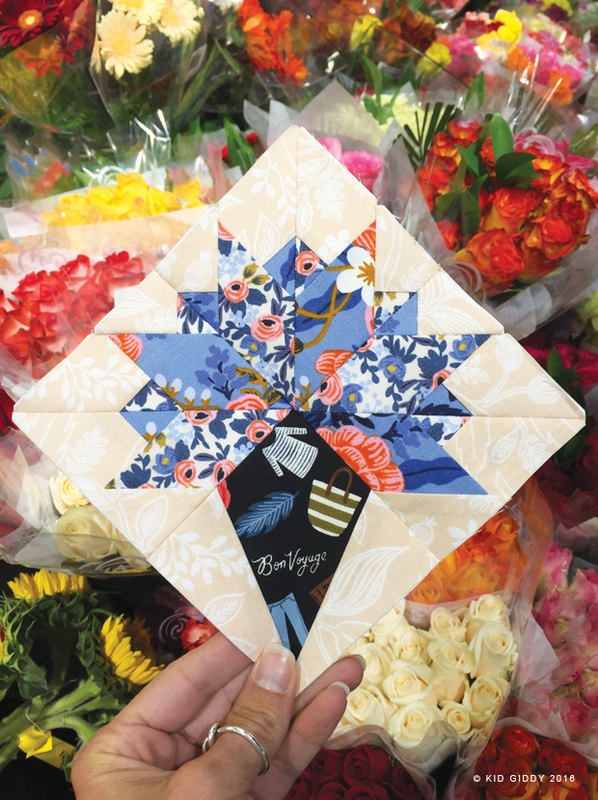 I think this Bride block could make a beautiful memory quilt for any wedding gift using the same colors and even prints as the bridal bouquets. Here I decided to use my new Rifle Paper Co floral prints because the flowers were just to perfect not to - right?! I always begin all of my paper piecing projects by coloring coding the pieces to keep things straight while sewing. It's even better if you color code it so the colors match the fabrics you are using, but I just grabbed a multi-colored pen, and a marker. Once all of the sections are sewn, be sure to press them before trimming the edges. Once you have trimmed them all, this block goes together quickly and easily as 4 mini blocks. Sew the larger sections together, and then add the little corners on as directed. 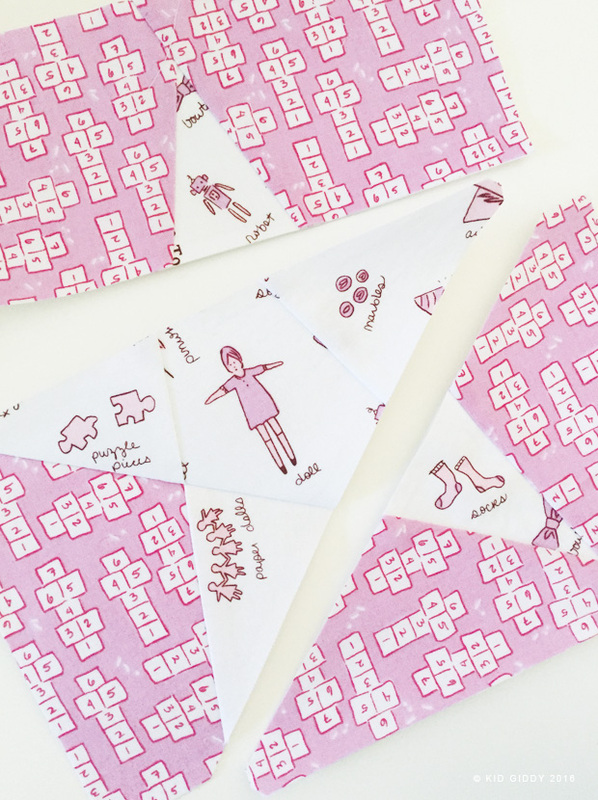 Sew two blocks together on both sides, then as a whole. This just might be one of the easiest in the book, with stunning results. If you want to check out my other Farmer's Wife block post, you can check out Malvina here. If you want to join in on the fun, you can find Angie's Bride tutorial on her website Gnome Angel, as well as grainline tips from Marti on her blog. 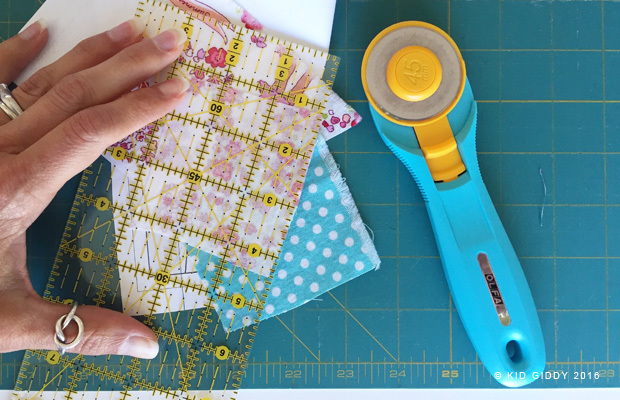 You can get the book and all your fabric needs from The Fat Quarter Shop and the Marti Michell templates from Marti's website! Thanks so much for stopping by. Show me your bride blocks by tagging me on Instagram @kidgiddy. I'd love to see them. 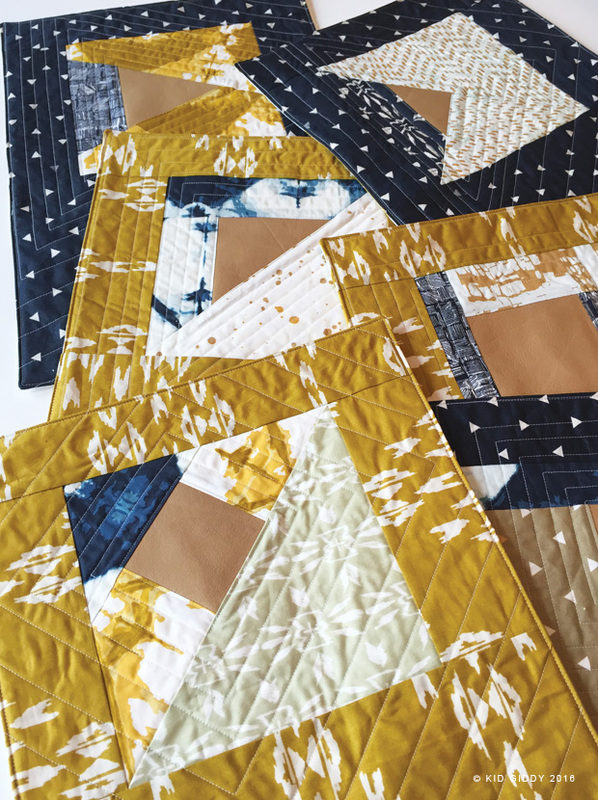 Two Land of Magic Quilt blocks in one day? Yep! If you've finished your Crown block let's have some fun with the Star block. I designed this block to maximize the fussy cutting potential. 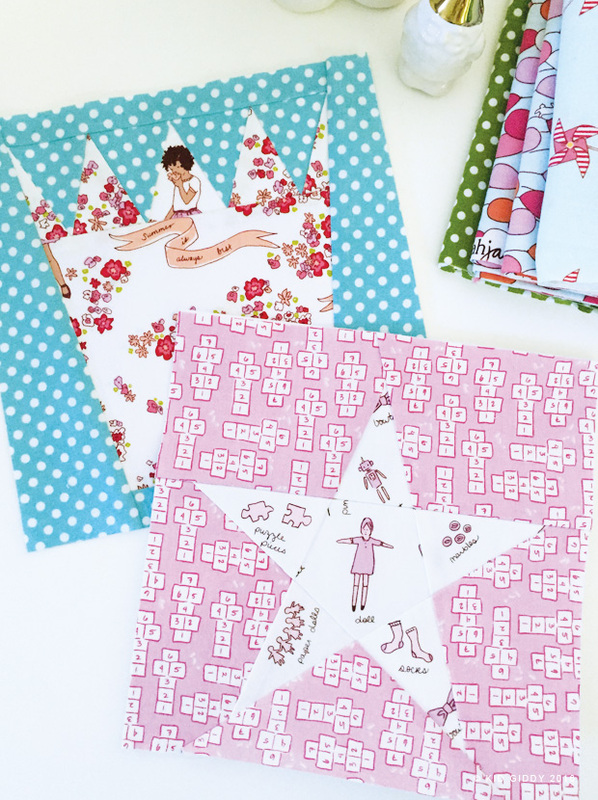 I just can't help myself when there are cute little designs from Sarah Jane Studios fabric patterns. I also wanted to make sure there wouldn't be any Y seams. 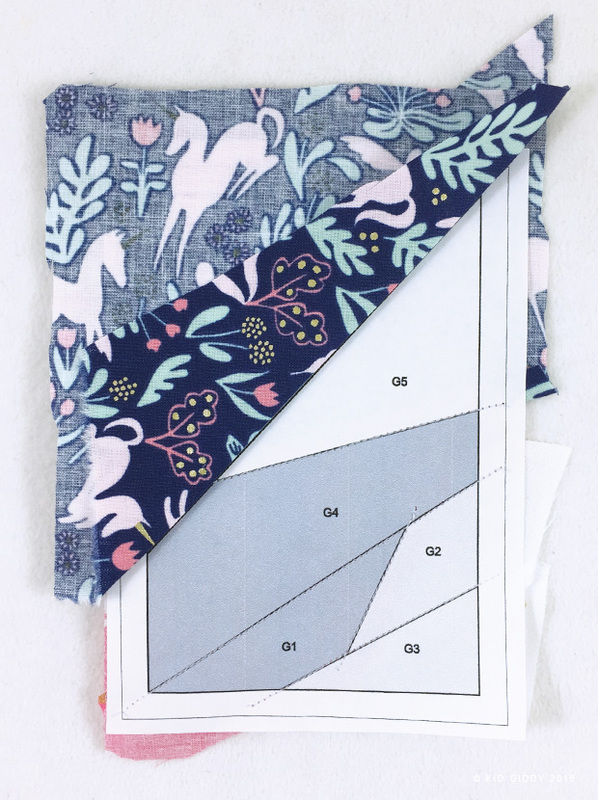 Before getting started - check out these two previous posts for all the sew-a-long details and the initial paper piecing how to's while making the Crown. 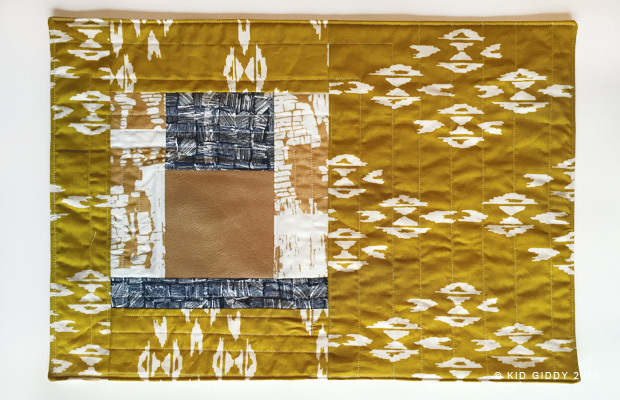 If you just arriving - check out the Land of Magic Quilt sew-a-long post for all of the details. Then visit the previous post for all the details on paper piecing and making the first block - the Crown. Ready to make the Star? 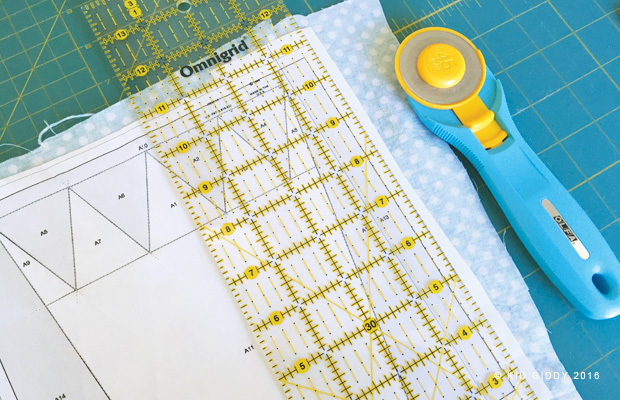 Begin making your star with a fussy cut piece of fabric in the center of section C. To prevent your fabric piece from shifting around, pin it in place. Flip the paper section over and place the fabric right side down to ensure the fussy cut piece for C2 will be aligned. Fold the fabric on the same line where it will be stitched. 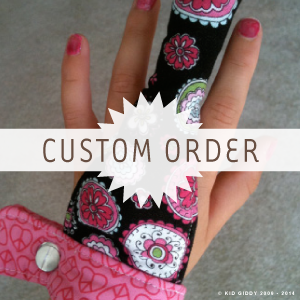 Place the fabric in the same place just underneath the pattern piece. Visually align the letters or design in the same area to be sure it will be properly placed. Use a light source to confirm placement. This same method can be used when dealing with directional fabric prints. When each of the pattern sections are sewn, press each piece prior to trimming. After trimming, connect section C to D. Prior to sewing these two sections together, pin them together. Fold along the seam allowance to be sure the edge alignment is correct. Press open sections C & D before attaching section B (bottom corner). 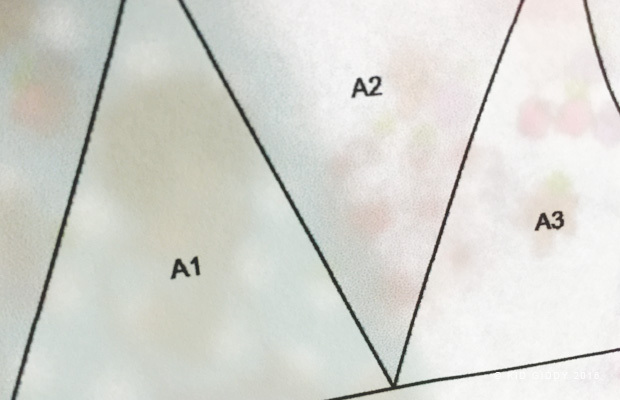 After sections B, C and D are connected, center section A to C and sew all the way across. 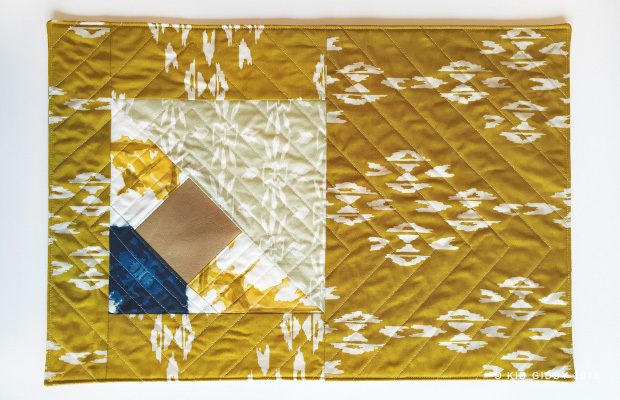 The Star block (as well as the Crown block) is great for an entire quilt. 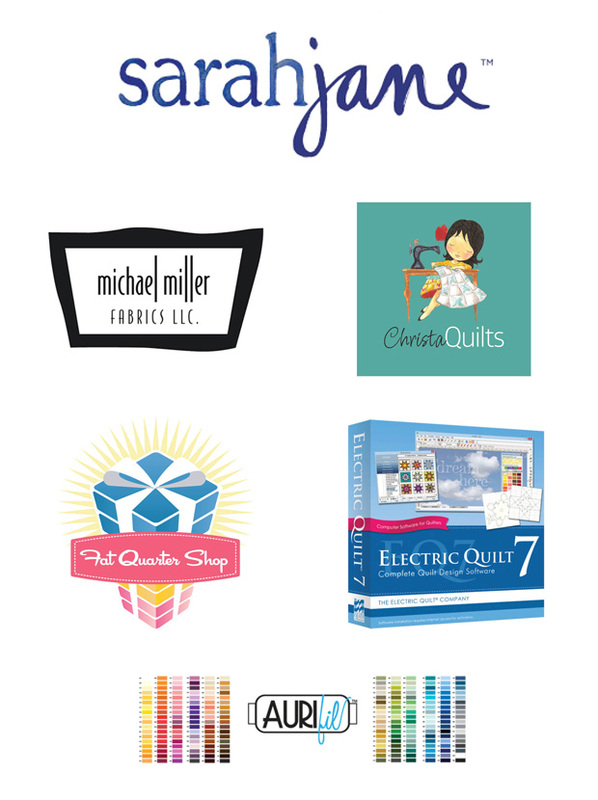 This sew-a-long is generously being sponsored by some awesome peeps and companies. 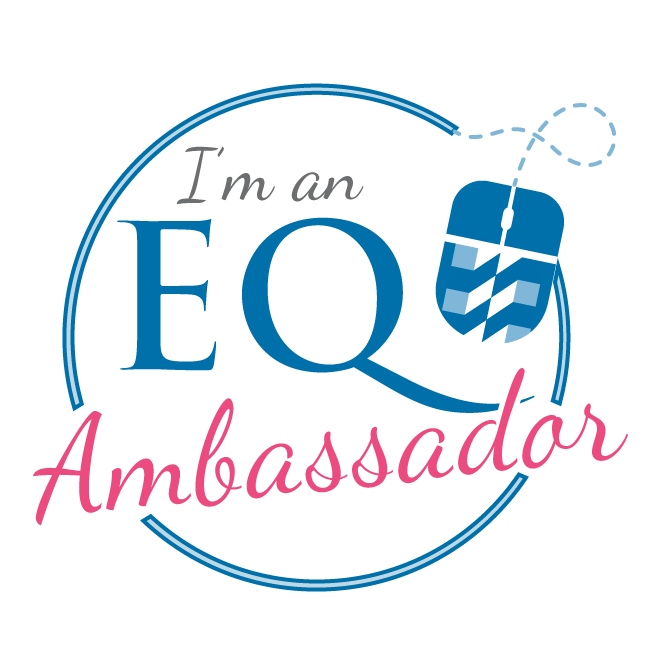 The first prize is a $25 gift certificate from the Fat Quarter Shop. 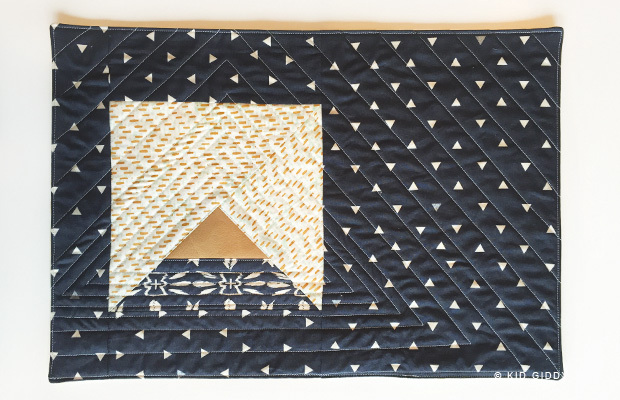 For your chance to win the prize from our first block sponsor, be sure to follow me @kidgiddy and @fatquartershop on Instagram and share your crown and star blocks when finished on IG, tagging them with #landofmagicquilt as well. As each block is released - there will be a block sponsor announced and a prize from said sponsor. When the next block is released the winner from the previous block will be announced. The Crown and Star blocks are being released together (although in two posts) so there is one prize and one winner. 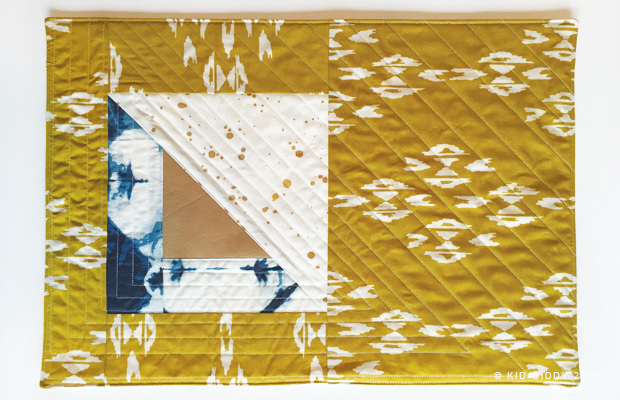 When all is said and done, if you finish your Land of Magic quilt and post a pic on IG - your name will be in the running for the Grand Prize as a thank you for participating. Thank you so much for joining in on the Magic. I can't wait to see all of your pics! If you have any questions - please let me know. I hope you had fun making your Crown and Star blocks. 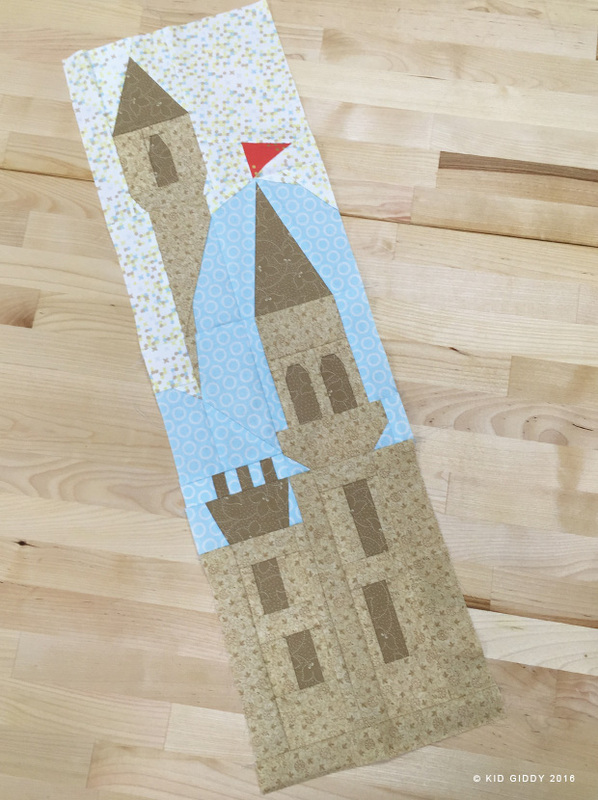 The Castle block will be released next week, so come back for more fun paper piecing with me! Disclaimer: I received fabric from Michael Miller Fabrics back in April to design this quilt for Sarah Jane Studios Quilt market booth. Opinions are my own, and there are no affiliate links. Thank you. YAY for day 1 of the #LandofMagicQuilt sew-a-long. The Land of Magic Quilt was designed using Sarah Jane Studios newest MAGIC fabric line with Michael Miller Fabrics. We are starting with the Crown today as that is the simplest block in the whole quilt. 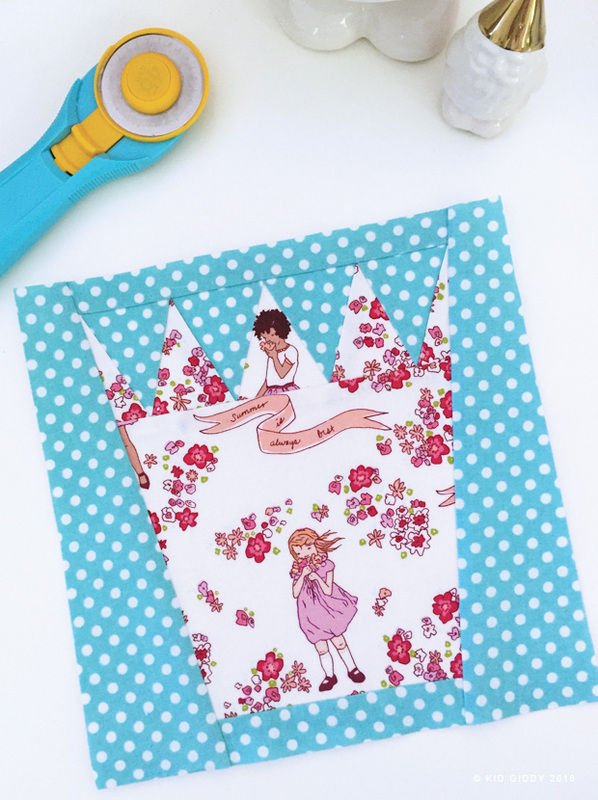 The crown is perfect for some cute fussy cutting, and is the only block that is one complete section. When Sarah and I began discussing a collaboration, we talked about mermaids and dragons and all things mythical/magical. The Crown was the first block I designed in EQ7 and was instantly smitten. Because of it's size, the crown will print on two pieces of paper. 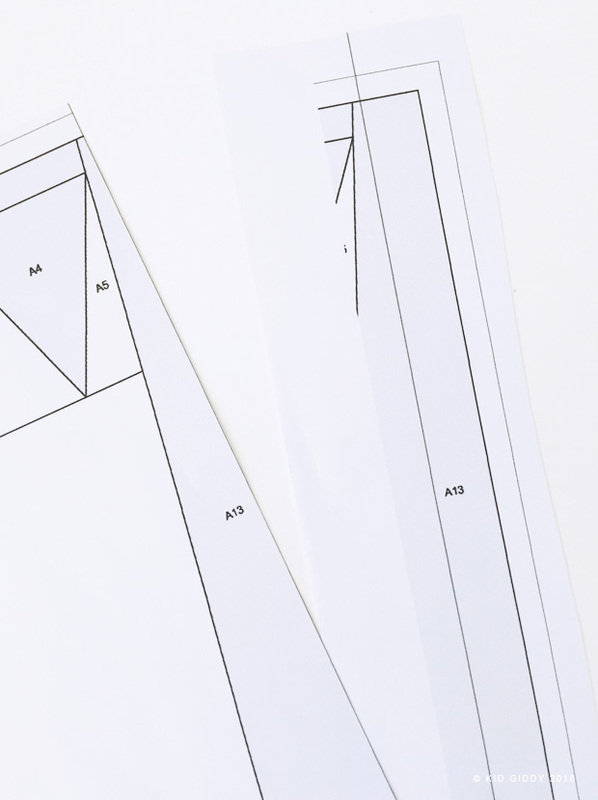 All of the PDF patterns have been formatted for 8.5" x 11" printing to make it easier to print at home. If you are just joining the Land of Magic Quilt sew-a-long, you can find all the details in this previous post. 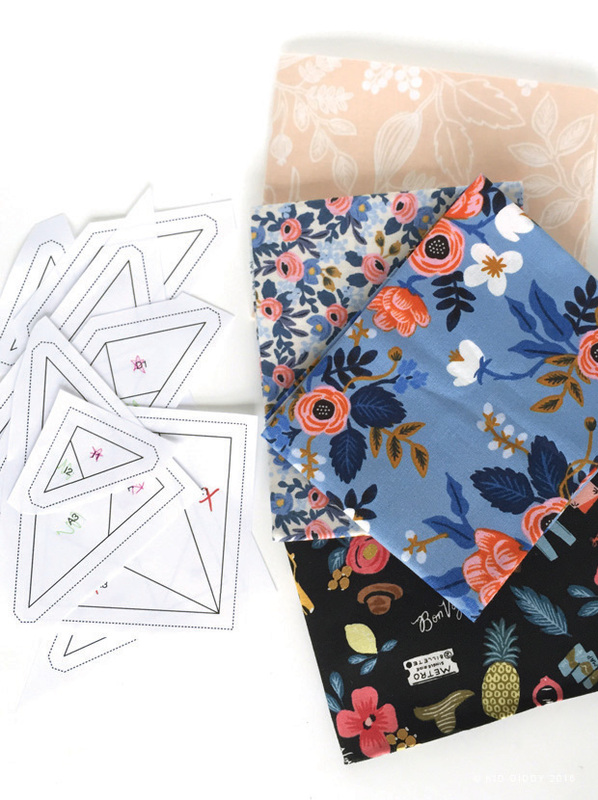 You can purchase the Sarah Jane Studios Magic Fabric Kit from the Fat Quarter Shop, as well as the backing set. 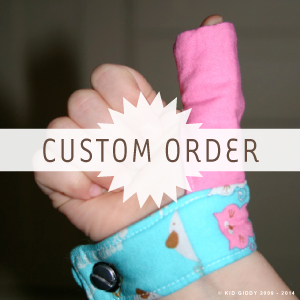 All of the patterns can be purchased in my Kid Giddy Etsy Shop and also on Fat Quarter Shop as well. 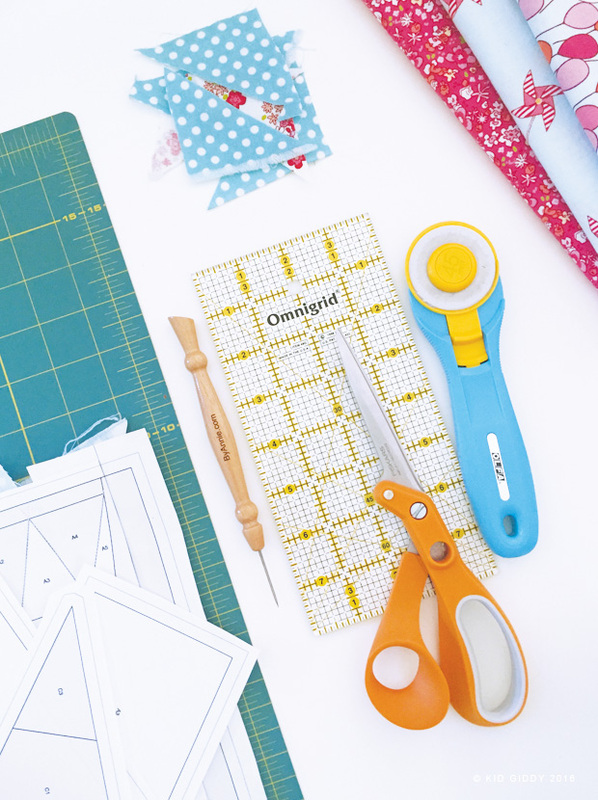 You'll need some tools for paper piecing and some to make things easier. When paper piecing, I prefer to have my cutting area right next to my sewing machine to prevent having to get up after every stitch. If possible have a small ironing station near by as well. You'll need the following (not all items are shown), your paper pattern pieces, paper scissors, fabric scissors, acrylic ruler, rotary cutter, self healing mat, tape for the crown block, stiletto with presser, an iron, and ironing mat. To begin - Cut out your two crown pieces. I always leave extra paper along my edges giving me extra seam allowance. I'd rather have extra fabric along the edges than not enough. Line up the edges, and tape the right side of the block to the left to make it whole. 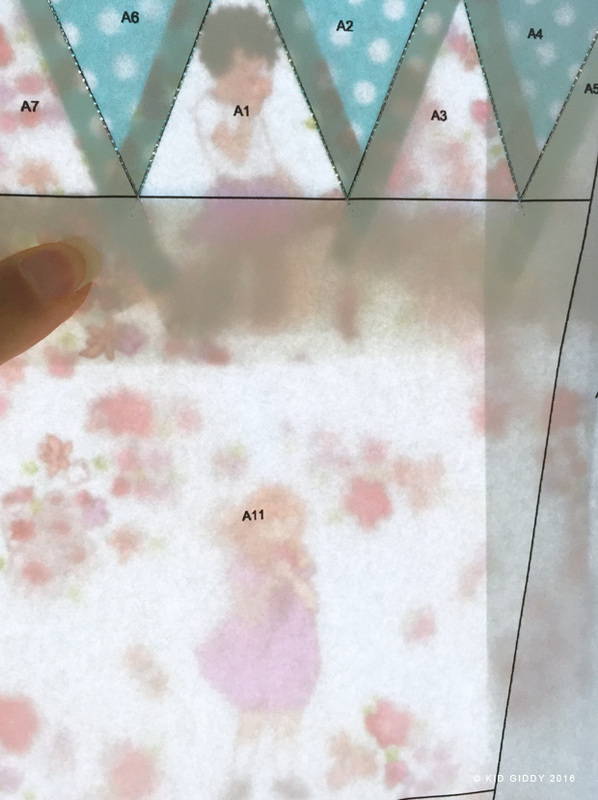 Any time you are paper piecing, only place the tape along the parts of the edge where you won't be stitching. This will make it easier to tear apart the paper from the fabric later. Using a light box, your sewing machine light or a bright window source, place your fabric piece in the center of A1. With the paper on top, the fabric would be facing outward underneath. 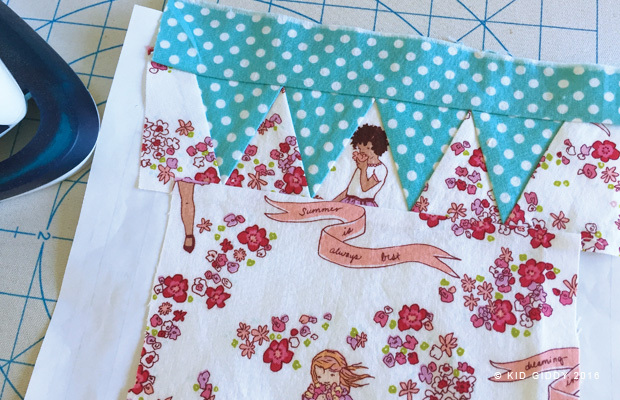 You don't have to use A1 for a specific (fussy cut) design, but if you do want to, this is a great place to add a little image from the fabric. Place the fabric piece for A2 right side together with the piece from A1. You'll see in the photo below the darker edge in A2 which becomes the seam allowance once sewn. Be sure there is at least 1/4" seam allowance, if not a little more. If the paper was removed, this is what the fabric underneath would look like. Both fabrics are right sides together, you are just sewing on top of paper. 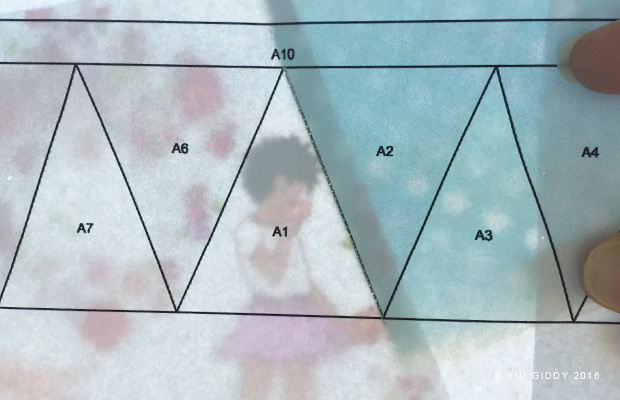 With your fabric placed underneath the paper, sew the line between A1 and A2. 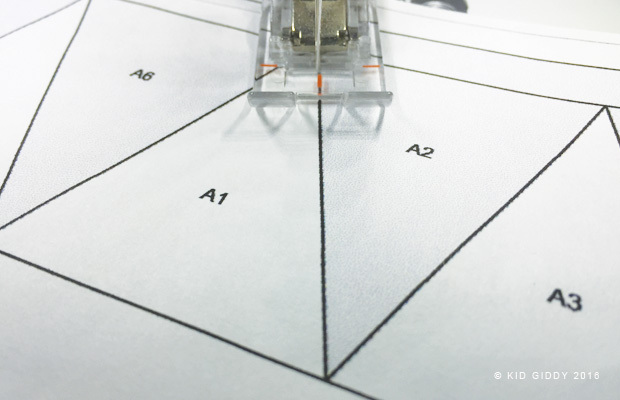 Use a smaller stitch length on your machine to make it easier to tear off the paper pieces without ripping the stitch. Fold the paper over and the correct fabric pieces over to expose the seam allowance. 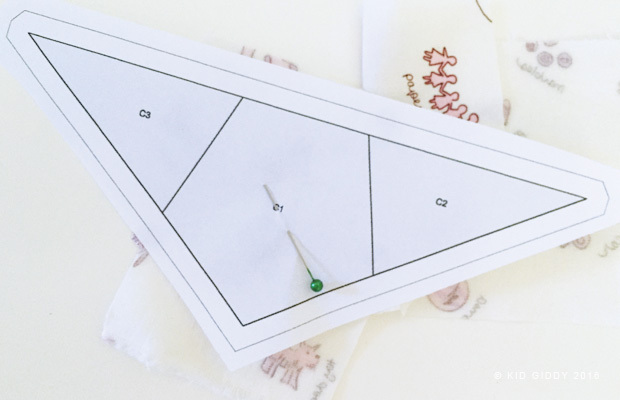 Line up the ruler with the 1/4" line on the stitch and trim off the excess seam allowance. After trimming the seam allowance open up the fabric for A2 and press. Now pieces A1 and A2 are sewn in place. (In the image below you can see the seam allowance. If you forget to trim off the seam allowance at any given time, you can go back and trim off some of the fabric but not all of it. It's best to trim after each stitch). 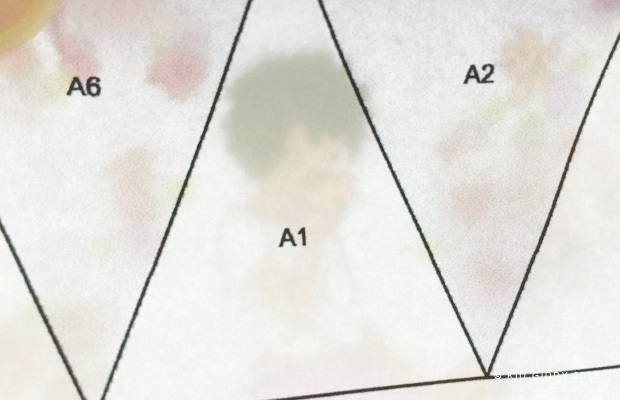 Place the next piece right side facing under A2 and be sure you see a shadow on A3 for the seam allowance. Then sew along the line between A2 and A3, trim the seam allowance, press and continue with A4. When all of the crown tips are sewn, sew the strip along the top edge, and then sew the base of the crown. The base is also a great opportunity to place a specific image from the fabric. 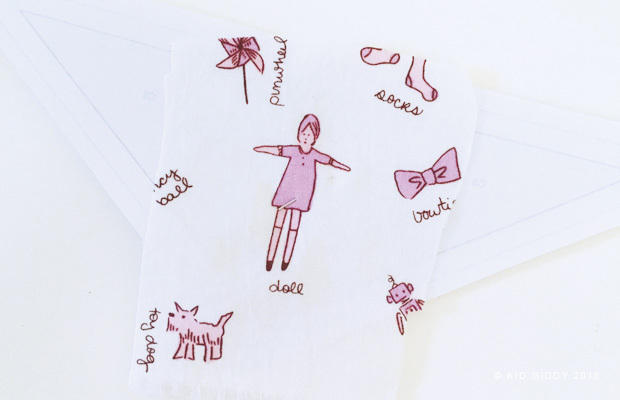 To do this with a larger piece of fabric, you can place the fabric right side down and fold the fabric along the line to be sewn. Make sure all of the edges of the entire piece are beyond all seam allowance lines. Place the fabric underneath the paper and line up the fold to the edge just as you did on top of the paper. You can see in the image below how that would look. After stitching this piece in place, trim off the seam allowance. Press the crown base piece and all of the other pieces before sewing the skinny base, and the last two edge pieces. When working with larger fabric pieces, pin or lightly glue baste to prevent it from shifting and buckling. When the entire block is sewn and pressed, carefully trim the seam allowance from all four sides. (Whatever you do - do not cut off your seam allowance at 2:30 in the morning like I did on a mini quilt one time, because you can't put it back on). Do not remove the paper until the whole quilt top is sewn together. Leaving the paper on will make it so much easier to add the sashing and borders without distorting the pieces that are sewn on the bias. 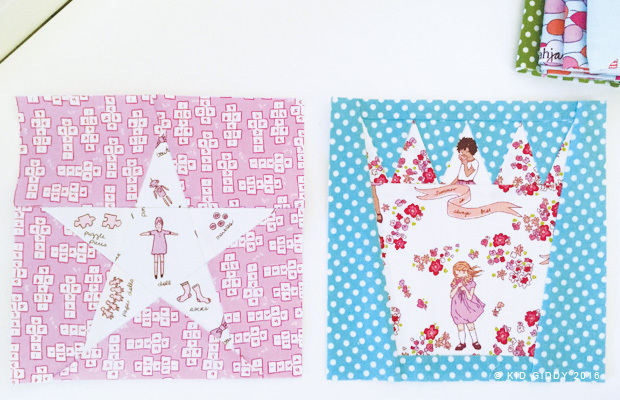 Now that you've sewn one full block, check out the Star block and learn how to sew four sections together in sequential order to make the second block. 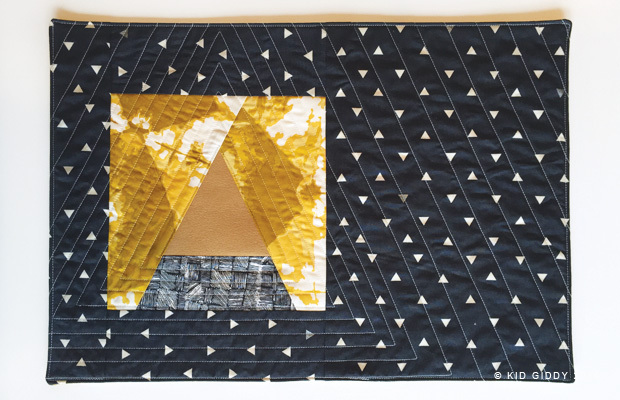 Today's block blogger is Rhea from Alewives Fabric. I love to drive up the coast of Maine and visit her in her beautiful red barn quilt shop. She decided to make her Crown block into a little Tooth Fairy Pillow with a pocket on the back and wicked cute fussy cutting. You can read more about her pillow by clicking her name above. Thanks so much Rhea! Thank you so much for joining in on the Magic. I can't wait to see all of your pics! If you have any questions - please let me know.